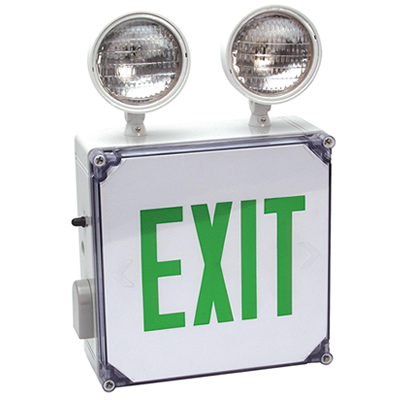 For the best protection against corrosive atmospheres, dust and water, this combo Exit Sign series protects you, even in the worst conditions. • Includes energy-efficient LED lighting with a life of more than 25 years! • A special polycarbonate housing protects against the worst elements, while LED lights require very little energy. 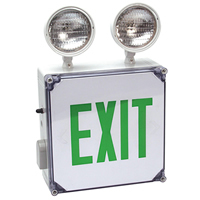 • Removable directional indicators are included with your Exit Sign. • Meets NFPA Life Safety Code 101, NED, OSHA and local codes. • Lamps add 6.5" to the height of this unit. • Ni-Cad Battery Backup is standard. Single-sided units available only. • You may also be interested in Wet Location Emergency Lighting.